R|277} Outline of violet leaf (enlarged). 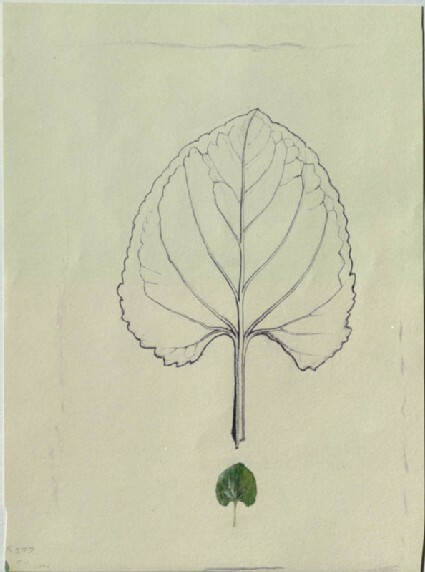 M.
This group consists of exercises in plant-drawing, directed especially to the marking of structure. The violet leaf here drawn is represented, at the top, of its natural size, below magnified with an ordinary pocketlens. It is given as an extremely difficult example, both the branching and serration being irregular; nor have I yet been able to arrive myself at any satisfactory mode of expressing the gradation of the ribs into their cellular tissue. Yet I mean this piece to remain in the school to give what encouragement it may to the pupils who, I hope, in numbers will succeed in doing better; and also as an illustration of the special requirement in such studies. The stalk is represented as twisted because it was twisted, although for the purposes of analysis it would have been much more advantageous to have pinned it down straight, but the essential characters of plants are only to be learned by drawing them in the positions they naturally fall into, and not by forcing them into those which are convenient to us.